Easy to use, offered Pressure Filling Vessel is superior in quality and durable in frame. We ensure on time delivery of this pressure filling vessel. We are an ISO-9001 company and largest exporter of gas equipments . We offer Insulated Storage Vessels. Our organization counted as a leading manufacturer and undertake turnkey projects for silos and bulk Storage Vessels. Our bulk storage vessels finds their wide application in defense industry and we have undertaken turnkey projects for defense industry of our country. We have manufactured and supplied wide range of large size silos to our customers. 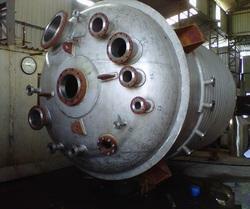 We offer to our honored patrons the first-class range of Pressure Vessel. Furthermore, our patrons can avail this product from us at affordable rates. We have an exclusive range of Fermenter Vessels offering to our clients. These products are designed and fabricated with high graded steel and other machinery components as per industry trends. These provide solutions for dairy and food processing industry. Our company holds vast experience in this domain and is involved in offering Industrial Storage Vessel.